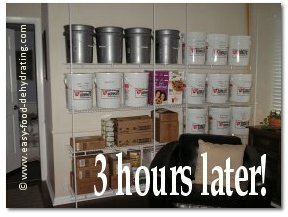 Here's a great starting point for our dehydrated food storage wall! When you've found suitable space it's time to either go in person, or online. Check out these closet organizers from The Container Store. If there's truly no room in the house itself, please consider putting your closet organizer out in the garage (preferably an air-conditioned garage if you're that fortunate). My husband went to the local hardware store and purchased two of the cheapest closet organizers that span 5' to 8' width and two extra 48" wire shelves. Turns out I still need some extra shelf-supporting clips, but they're on their way! If you don't have such a helpful-hubby (or wife! ), then by all means, shop online and have it delivered! See the ClosetMaid system(s) at Amazon.com by clicking on the Amazon ad. It's not very hard to put together these closet systems – get a spirit level and just follow the instructions that are included in the closet shipping boxes. From start to finish, it took about three hours to do the whole job! I do intend to have some drapery on a rod for the dehydrated food storage wall, so that the whole shelving unit can be hidden behind it. I may have another row of shelves right on top as there's still enough room left on the four uprights to do that but I'm not sure if I'll be able to access it ... but right now I'm worn out, so maybe tomorrow! I just wanted to share this with you all to give you an idea of what you can do at your home. The buckets contain dehydrated peas, carrots, you name it! 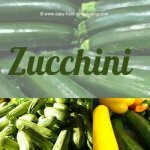 See how to dehydrate ALL our veggies here. And see ALL our fruits here. Yessss! I found the drapes ... 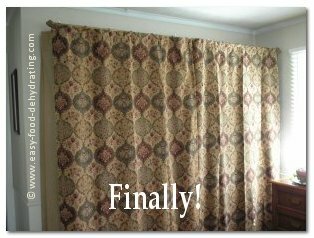 I used round curtain rings which I sewed to the tops of the curtains. 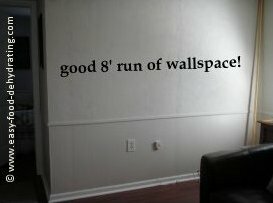 Well look at that – I finally finished the wall – it only took me around six months to get "a round tuit"!!! For information on how to safely store dehydrated food, check out our food storage page.